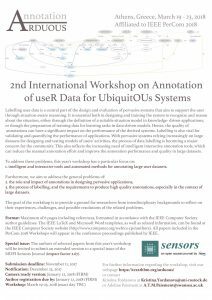 Together with Adeline Paiement from the Swansea University and Jesse Hoey from the University of Waterloo, we are guest editors of the MDPI Sensors’ special issue on Annotation of User Data for Sensor-Based Systems. The issue contains original previously unpublished works as well as extended versions of selected papers from the ARDUOUS workshop. For more information, visit the issue’s web page.